Within each of us is a voice ready to spiral OUT into an enormous sky. Unfurl it. Voice begins deep within. Along the back corridors and secret passageways. Voice begins at our silent center, the core of our being where everything exists at once. Vibrating. Within each of us is a path from inside to outside. Look for it. Within each of us is a silence of truth longing to be expressed. Feel for it. Dropping into the spaces that live within, Unfurling invites us into the dance between silence and story until we can let go into our own expression. The final book in the anthology trilogy from The Heart Of It Collection. 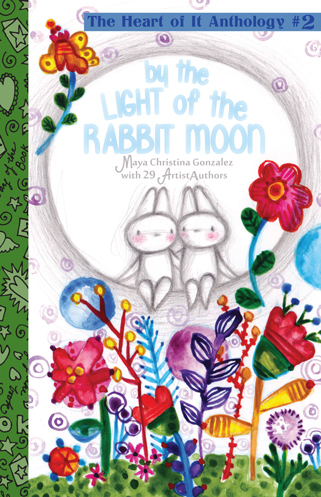 Award-winning children’s book artist and author Maya Christina Gonzalez’s experimental illustrations and simple poetic narrative highlight the poems, stories, and art of 18 new and emerging diverse children’s book ArtistAuthors. Love, creativity and power fill the pages! 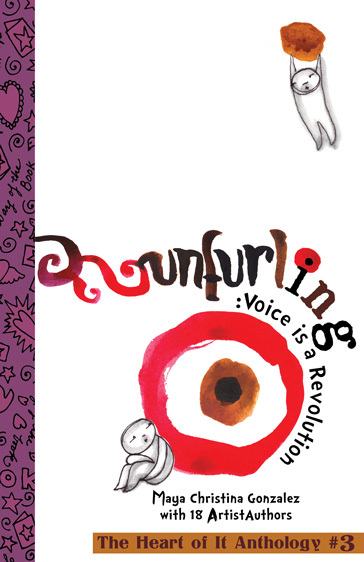 Always pushing the limits of how children’s books can be used, Unfurling explores the possibility of what stories lay within the minds of our children and how to engage their creative agency through imagery. 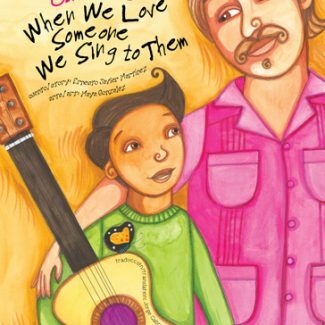 This book is the third (and final) in The Heart of It Collection: a 3 book anthology series in direct and immediate response to a lack of equitable and relevant representation of the people in traditional children’s books. Ovid is a playful beacon whose Divine Powers include Honoring Children and Nature, Shapeshifting, Sassmouthery, and Being Creative, True, and Very Wiggly. Enhanced by these Powers, Ovid prances boldly through Life Preserving and Sharing Stories which are now Growing into Books. Crystal is a lover of rainbows, flowers growing in the cracks of the city, and making up songs. She is an artist-healer and has the pleasure of teaching art at a middle school in Fruitvale. She lives in Oakland with her partner, the Poetic Librarian, and their 2 cats. Adrianne has always enjoyed listening to, reading, and writing stories. She loves her family, children, bilingual education, animals (especially cats, dogs, and elephants), the beach, ice cream, dancing, traveling, photography, music, and yoga. 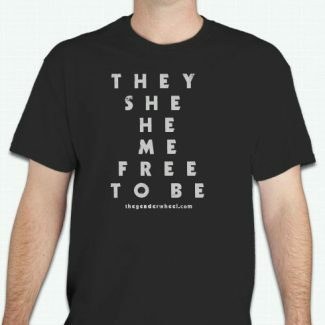 She believes in love, peace, kindness, mischief, questioning, life-long learning and growing. Adrianne lives in Hillsboro, Oregon. Erika was born in Eagle Pass, Tx, border to Piedras Negras, Coahuila, Mx where she learned to honor water and the ancestors. Her poem was written for PODER, en environmental justice organization. Erika currently teaches Kindergarten at Roses in Concrete in Oakland, Ca, is an Aztec dancer, and a mother. Priya dreams of a writing career, living in New York and owning a piano. When she’s not writing, she loves reading, yoga, movies, drawing, nature, and dreaming. She wonders what it would be like to own a magic wand. Jill loves teaching mindfulness to youth and is in her thirteenth year as an Oakland classroom educator. She is the author of, Long Hair Don’t Care – A Poem About Boys With Long Hair. She is grateful to have been raised in the open-minded and embracing Bay Area. Kelly uses meditation and creative expression as a way to be in tune with her heart. She works with kids and adults, providing them with guidance and tools to connect and uncover their unique heart colours. Kelly’s first picture book, Lily from colourless to colourful, is now out into the world. A tech person for many years, Rosalind is now branching out into illustration and writing children’s books. She has also illustrated greeting cards and other gifts, some of which have won awards. Her writing experience includes reviewing books. You can also find her dancing lindy hop in her spare time. Judith loves books, children, and nature, including outer space. When she was young, girls couldn’t have dreams like being an astronaut. Now she encourages all children to not only dream, but to also find ways to fulfill those dreams. She is a published writer-illustrator. Shanimarie grew up in Jamaica and has a passion for teaching. She is also an elementary educator and instructional coach who enjoys learning and laughing with her students. She remembers with joy, hunting for crabs in Jamaica. This is her second literary contribution and has other writing in the works. Elana’s a dreamer, a stargazer; she loves to dance, to sing. All children delight her. She recognizes the child within herself and within everyone she meets. In Connecticut, she’s been Director of a creative Sunday school program for many years. How exciting to share her first poem with her children’s children. Sonia has been telling cuentos since she’s been very young. She loves stories about family, unity, and love. Sonia is a teacher by day and a writer by night. Sonia is from Juarez, Mexico and from Chicago, IL. 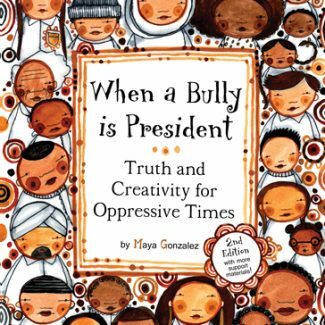 The story in this collection is based in true events. Marianna is an Oakland Spanish dual-language teacher. She grew up in Evanston, IL and moved to California in large part because of her love for the ocean and sunshine. 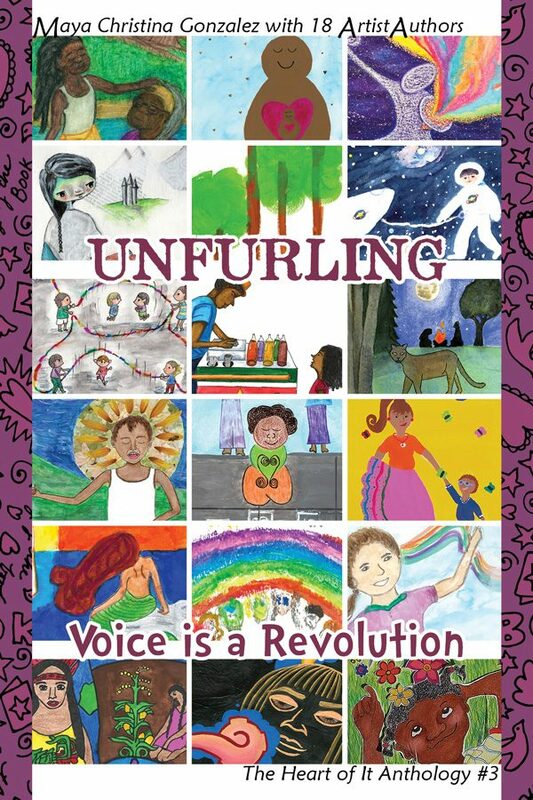 Her sister, childhood friends, and students inspired her to write and illustrate this story. Karen lives in the Arts District of Oak Park, IL where she met Tia Etu. Watch this video to see Tia busy in her studio: Watch Video. 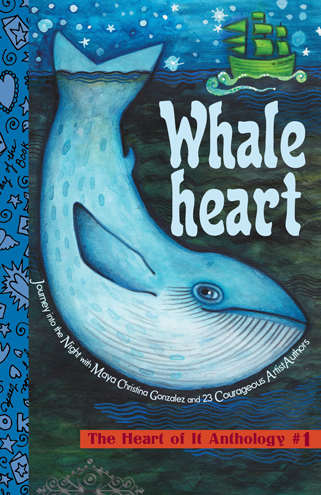 Karen is sharing Tia’s story to inspire all young artists to create whatever comes to mind. Karen would love to see your creations! Chantra loves hamsters and jasmine green tea. Her favorite stories to write are ones that celebrate culture and language. She also loves to doodle in her spare time. Her dream is to create many more characters that help others in their journey of self-discovery. alida loves singing sacred songs underneath grandmother luna and ancestral stars. alida creates space for gender self-determination with her gender fluid child, a’lialei. alida practices her storytelling craft in Milwaukee and homelands of her family, Yucatán and Panamá. 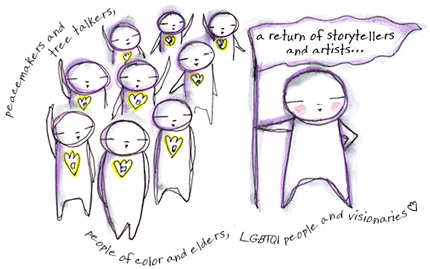 alida dreams of publishing radical books for Indigenous, Black, and Brown gente. An early career as a park ranger and tree-hugger led Robyn to her life-long love of illustrating and education. 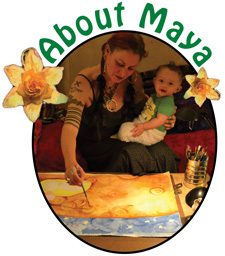 She has been involved in both for over 20 years, including homeschooling her two children and creating online art lessons for homeschooling families. Pronounced (Yo-wall-tla-weez). As a child, Laura admired the moon and stars, knowing no matter what she would always be connected to her family across the border under the same sky. Her upcoming children’s book series introduces the Toltec/Aztec teachings of Tezcatlipoca as a tool for overcoming obstacles in order to shine bright!